Paul Stamets, a renown fungi expert, calls decomposer or saprobic fungi the grand molecular disassemblers of nature. It's a perfect description. These organisms take large, complex organic molecules, like the fats, carbs and proteins, found in dead plants and animals, and disassemble them into the simple inorganic compounds such as water, nitrates and CO2 that plants use as nutrients. The average compost pile has a huge variety of material in it. Each material has a set of molecules - some simple and some complex. Each decomposer fungi produces a limited number of enzymes. Each enzyme decomposes a limited number of complex compounds. To fully breakdown the complex plant and animal bodies that are present in your compost, you need many different members of the soil community. Here we'll focus on the waves of fungi that colonize your compost. First colonizers of composts and leaf litter. Digest simple sugars but not tougher plant fibers. Populations swell when food sources are abundant. Secrete antibiotics to ward off competing bacteria and fungi. Among the few fungi that can survive high the temperatures 65-75C (150-165F) in the compost. They are in part responsible for creating those temperatures. Die off when their food sources are depleted. They are important in decomposing woody materials. These digest the cellulose and hemicellulose in the partly decomposed plant material. Includes the fungi that decompose hair, hooves, claws and horn of animals. They leave behind a crumbly, lignin rich, dark brown substance. Hence the name brown rot fungi. These fungi are very specialized. Each species exudes only a few enzymes that decompose only a few molecules. One for example, Amorphotheca resinae, decomposes jet fuel - not that you'd have any of that in your compost. 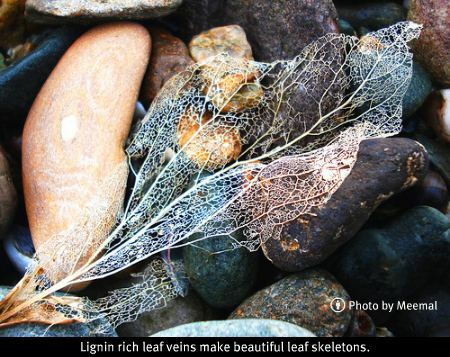 Leaf veins are rich in lignin. Those beautiful leaf skeletons are what is left after this group of fungi is done. These are common in the curing phase of composting. They like cool temperatures. Turning the compost pile at this time disturbs these fungi breaking up their hyphae. These can break down lignin, waxes, and tannins, the most difficult plant residues. They can also break down cellulose and hemicellulose. The residue left is white, ergo the name white rot fungi. Those Mushrooms Look Good - Can I Eat Them? 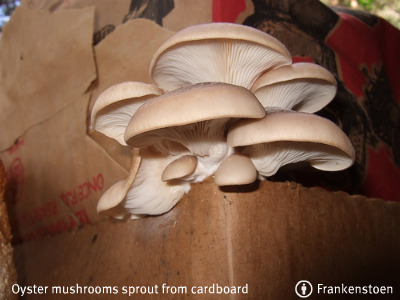 You might find some delicious looking mushrooms growing in your compost or mulch. Heed this first. WARNING: While many saprobic mushrooms are edible, most aren't. There are around 1.5 million types of fungi. We've only described and named about 75,000 or 5% of these. Of these about 250 are good to eat and at least 200 will make you very sick or kill you. It's often hard to tell the difference between the delicious and the killers so don't eat what you don't know for sure is edible. Cellulose Feeders - these eat heartwood of trees, wood chips, wood shavings, sawdust, and straw. They include shitake, oyster, reishi, chicken of the woods, and turkey tails. Compost Feeders - these eat forest floor duff, compost, and manure. 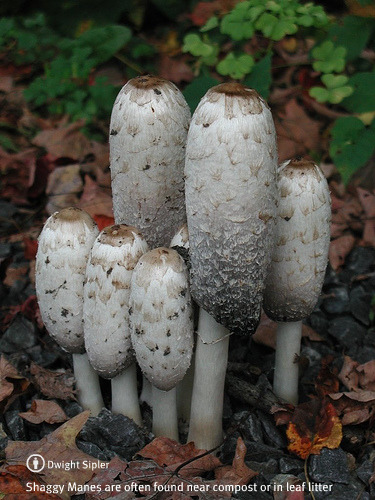 Common compost feeders are button mushrooms and shaggy manes. Last winter I grew oyster mushrooms in coffee grounds. Fungi are a vital part of healthy fertile soil. We already know their role as decomposers, recycling nutrients back to plants. They infuse the soil with a mat of hyphae that serve to hold the soil in place. Paul Stamets says they can absorb and hold up to 30,000 times their mass and are in large part the generators of humus soils throughout the world. But most of us are a little nervous around fungus. Seeing a mushroom sprout in your lawn, or your wood chip mulch sporting a white fuzzy fungal coat, isn't usually a cause for celebration. More often we'll search for fungicides. In truth we'd be farther ahead encouraging them and making conditions better for fungi to establish themselves. Stop tilling your garden - especially rototilling. This really destroys the fungi strands and makes it very tough for them to establish. Let your compost cure undisturbed for a few months before you use it so as to let the hyphae develop undisturbed. And don't screen your compost before putting it on your garden. Screening really slices and dices the mycelium. There are other players in the decomposition story. Bacteria, like fungi are primary decomposers. Other major players,like earthworms, ants, flies and termites, are often classed as shredders. They breakdown materials into smaller pieces making it easier for fungi and bacteria to do their job. Think you need Phosphorus Fertilizer? Maybe Mycorrhizal Fungi is your Answer. Paul Stamets TED talk - Six Ways Mushrooms Can Save the World.